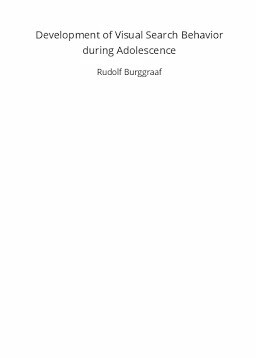 This thesis describes the developments in visual search behavior during adolescence, using a longitudinal design. It also describes the correlations between visual search behavior and other visuospatial characteristics such as visuospatial ability and visuospatial memory. The results describe, among others, the increase of visuospatial ability and visuospatial memory during adolescence and the finding that older children search faster than younger children while maintaining the same level of accuracy. 2. search behavior becomes more efficient with the repetition of the search task. This thesis end with some suggestions for further research, based, among other things, on two pilot experiments carried out in recent years.